A few weeks back I was standing in a room facilitating a large ideation workshop. Mid-session I found myself thinking, I am not sure if I enjoy this. Walking out of that workshop, I told myself that I entered into the design field to become a designer, not a facilitator. I felt that as a workshop facilitator, I could have been replaced with any other person, toolkit in hand. Sure, there are nuances experienced design facilitators bring (like knowing when to probe thinking and move a team in different directions) but a decent set of card-prompts could suffice. A good toolkit in and of itself could very well guide a novice team through the process, particularly since many design thinking workshops are aimed at beginners and most beginners cant tell the difference between good and bad design thinking. Design thinking is sold as a better way to work, to innovate. It has morphed into a practice that encourages so much collaboration that it has left lead designers playing an integrative (and intrinsically extroverted) role. I am no extrovert. I began as a ‘traditional’ designer, embedded in my own world (or that of a very small team), often left to our own devices to problem-solve through design. Commercial design thinking practice takes aim against this ‘lone wolf’ from design yonder, and shoots it squarely between the eyes. Commercial design thinking is theatrical and its workshops are an opportunity for presenters to perform to a large group of individuals. The problem I have is that I don’t think I agree with big collaborative design. I am not sure I agree that you should integrate everyone and anyone into the design process, at every step of the way, in big workshops. Yes, I make the exception with end-users, as this is the heart of the design process. However, I’m pointing at those projects that carry the client and/or big, broad networks of stakeholders across every stage of the design process. I understand that large workshops with key stakeholders are conducted in the essence of time and schedules, but this is not how design naturally flows. Crowdsourced design has become commonplace; gather a bunch of multidisciplinary individuals in a room and make sure everyone contributes to the creation of ideas. Make sure the same individuals also participate in prototyping, in research, in testing. Most often than not, these individuals- whilst bringing in diverse viewpoints- find design unnatural and uncomfortable. Design thinkers often find themselves facilitating these teams to do the design work, with little breath in-between to engage in the design process. Workshops started as a way to help clients and teams understand the process of design. Somehow, they have made their way into design practice. This more than often slows the design process down and requires more time up-skilling which detracts from actual designing and thinking. Of course, if the project intent is to build design capability amongst an organisation or team, then this makes sense to do so. But capability based projects and design projects have conflated. This problem exists not only for external design consultancies, but for in-house design teams. This issue naturally raises the topic of establishing a design culture; if everyone across an organisation is familiar with the process and approach, then each project can operate in a less rigid and more organic manner. It is this intuitive flow that is lost when you need to design and facilitate capability uplift through collaboration with a large set of stakeholders, leaving no one really feeling their way through the design process. It is this situation that I question if we are really doing design, or just superficially skimming the cliche. It is in this situation that I ask myself if I am actually designing, or if I am reduced to merely that of a passive facilitator- at best- an active integrator. It is in this situation that I ask myself if you really need an experienced designer, or simply someone who can run a workshop. It is in this situation that I ask how an ‘experienced design thinker’ perceivably differs to a novice, when faced with a room full of stakeholders fresh to design practice. It is, however, in this situation that I know a small, engaged design team working intensely and consistently performs far better and with greater understanding than large, sequenced and structured workshops. When you think of the word ‘innovation’ what comes to your mind? Many will say Uber, Steve Jobs, Elon Musk or even design thinking. Today, if you peer into the world of design, you will be bombarded with the word innovation. Innovation is becoming a permanent buzzword for the design industry, but is this really a good thing? The term innovation derives from the Latin word innovatus, which is the noun form of innovare “to renew or change,” stemming from in—”into” + novus—”new”. Although the term is broadly used, innovation generally refers to the creation of better or more effective products, processes, technologies, or ideas that are accepted by markets, governments, and society. Innovation differs from invention or renovation in that innovation generally signifies a substantial positive change compared to incremental changes. Innovation is defined simply as a “new idea, device, or method”. However, innovation is often also viewed as the application of better solutions that meet new requirements, unarticulated needs, or existing market needs. This is accomplished through more-effective products, processes, services, technologies, or business models that are readily available to markets, governments and society. The term “innovation” can be defined as something original and more effective and, as a consequence, new, that “breaks into” the market or society. It is related to, but not the same as, invention. While a novel device is often described as an innovation, in economics, management science, and other fields of practice and analysis, innovation is generally considered to be the result of a process that brings together various novel ideas in a way that they affect society. In industrial economics, innovations are created and found empirically from services to meet the growing consumer demand. Looking at the definitions, there was sound reason to advertise design thinking as a process (if not the process) that inspires innovation. The point and process of design thinking can be examined and exploited as ‘innovative’, or conducive to innovation, with its goal to create or significantly improve our world via close examination and understanding of users and society. So what does foster innovation? How do we know when we have created an innovative solution? There are many ways to define and identify various levels of improvement. I am more intrigued with the misty cloud that leads specifically to an innovation. I definitely align myself with the writings of Roberto Verganti (in this book Design Driven Innovation) and of Don Norman (in a joint paper titled, Incremental and Radical Innovation), when they identify that innovation can exist via a radical redefinition of meaning as well as via technology. Norman argues in his paper with Verganti that design may only offer incremental innovation- which is ironically what the definition of innovation implies. The problem I find is that many clients approach designers using the term innovation and/or disruption, yet their expectation of improvement lies within the realms of invention. Unlike strategy, I don’t feel innovation is necessarily a competitive practice or goal, as we often discover innovations and new inventions through necessity or accident. It is often an act of discovery or re-imagination. Design thinking may be one way to achieve innovation, but I fear many feel it is the only way. There are plenty of other intelligent and well read individuals who specialise in the theory of innovation. I have not devoted as much of my research to investigating this topic, but I do have some frank reflections on what it is. I have written about the unrealistic expectations that often surround design and design thinking. Part due to practitioners over-promising an innovative result, and part due to professionals looking at existing examples considered to be ‘innovative’ and learning that design was at its foundation. The promise of innovation shot design thinking to fame, no doubt, but I am fearful that it is redefining the definition of design in a way that may set ourselves up for failure. Design consultancies that promoted Design Thinking were, in effect, hoping that a process trick would produce significant cultural and organizational change. As practitioners of design thinking in consultancies now acknowledge, the success rate for the process was low, very low. The one thing I have learned through my reading thus far on innovation is that at the point we identify a phenomenon as ‘innovative’ it appears as if spontaneous and out of the blue. What you often find is there was months, if not years, of research, prototyping, testing and design until it reached a point of ‘innovation’- a process that is actually incremental. It may appear true that industries are becoming disrupted in a more rapid way, but this is simply because we have instant and easier access to knowledge and/or materials than we did before. This merely informs us that we can speed up our pace of learning (and prototyping), but not of our innovations. I encounter a lot of debates between myself and those who defend the authority of big data. It made me begin to wonder what kind of perception we are generating and what kind of attitudes we are embedding into our practice due to this desire for a quantifiable truth. Logical positivism states that only deduction or direct observation is meaningful. Big data provides us with direct observation; a tangible source for which we can point and deduce as reality. But what are we really doing in this process, and what kinds of attitudes are being shaped and are shaping our approach to work? Much of my own design work involves direct engagement and documentation of peoples’ thoughts, lives, reactions and emotions. I am a messenger and a representative of someone else’s story. Ethnography is the methodology I often take in my work and with it comes an attitude that both aims to accurately describe the reality and perceptions of individuals I have studied, or sometimes, to emancipate those who are marginalised by a source of power. Yet, more and more I am asked, reading, and witnessing the attempt to introduce quantitative information into the accounts I produce on behalf of my participants. Surveys, sample sizes, statistics and predictive analytics are a few of the big data-inspired demands that are infiltrating human-centered design. Qualitative information is not enough. The growing perception is that qualitative, “small” data- such as the stories and insights that emerge from ethnographic practice- require the “validity” and rigour of cold frequency and hard numbers. At its extreme, qualitative research is not even needed. Numbers tell a story, and this story is edited by computer processing. Statisticians read this story received and report back. A kind of double hermeneutic is at play, except the co-creative conversation we are having about our reality is with a computer. Reducing what is human- into a code or a number to be quantified- is in essence an attempt to stabilise and transform emotionally driven (irrational) human behaviour into predictable (a la economic) beings. This of course is only a superficial representation of what we think is true; the kind of boiled down, reductionistic approach to make sense of that which cannot be controlled and predicted (much like the foundations of ecology). In an attempt to find a handle for control, big data and quantification is often used to assert authority and preserve hierarchy; data is used to leverage and exercise authority over a project, client, community and even society. Furthermore, this increasing preference for data not only reaffirms the immediate power and authority, but to a greater extent, requires us to forfeit our emotional autonomy to a machine. The craving for big data to serve as an ‘authority’ over our reality means we value and trust an algorithm over that which should understand and represent us the best- a human. For any one who is worried about AI replacing our jobs, this fervent and blind faith is doing nothing but accelerate this destiny. The persistence for data portrays an underlying desire for an objective authority- a highly rational and unemotional super parent. We see the computer as greater than us, our own motherboard Messiah that we have crafted to liberate ourselves. I find this liberation often results in laziness as people point to figures rather than figuring out problems, and in the process, lose sight of the perspectives of their peers. What kind of governance have we created and poured our trust into? We choose a machine to calculate us, and view it as an extension (and association) of the human brain (this makes me think of Herbert Simon). This mechanical organism is a better version of us; it is stronger, possesses a more powerful processing ability and infinite memory. However, this figurehead for objective authority is rational, emotionless and lacks empathy-much like the basic traits of a psychopath. Emotions are what makes us irrational beings. Our insatiable desire for data means we also wish to control ourselves; to contain this irrationality in order to become stable and predictable. This predictability is founded on a desire for control and control is founded through a fear of risk and loss. Loss aversion is one of the strongest human traits that drive our irrational being and we have turned to computers to parent us away from bad decisions. But as any good parent knows, sometimes you need to let your child make a few bad decisions in order to learn and grow. Am i saying we should abandon quantitative data altogether? No, not necessarily. Quantitative information has its purpose and place. What i am saying is, when we are dealing with what is in essence to be human (to design) we need to think twice before reaching for a number to justify our information. In human-centered driven work, such as design practice, emotions are just as much a valid source of ‘data’ as are numbers. What we really need to be strictly conscious of, is that we are not allowing ourselves to treat hard data as a superior source of information to qualitative reasoning. Both qualitative and quantitative information should remain equal. This is the reason why I had chose to use critical realism as the theoretical paradigm for analysing design practice. It provides an intellectual middle ground between our desire for control (quant) and emotional autonomy (qual), by emphasising neither and integrating both where appropriate. We must preserve our right to remain human-centered, and hold each other accountable when the temptation for big data-driven design takes control. This debate keeps cropping up like a seasonal virus. Once again, I encountered a bit of chatter across the internet and amongst practitioners on the ol’ topic that design thinking has failed to live up to its hype. This is a post explaining why I believe these reoccurring debates flare up, and why they continuously reignite. I am in a pretty unique position. I have experience and perspective as both a design academic and design practitioner. In research I spent four years as more or less an observer; watching the design process from afar in order to elevate insights which may be buried in the day to day that often robs us of adequate reflection. As a researcher, I forgot just how much crap there is to wade through when neck deep in the detail. I don’t mean this to sound negative. The crap I am talking about is the everyday: the admin, the mundane, the mess of life that day-to-day work seems to generate. Throw in budgets and tight timeframes and we barely have space in our brain to remember where we parked the car in a given day. There are two manifestations of design thinking and design practice; internalised (lone) design thinking and externalised design thinking that manifests collectively and collaboratively from a group. I wrote a bit about collaborative design thinking in my thesis, and this is certainly where much of the discussion about the practice of design thinking is situated. What intrigues me is that there is a lot of writing on the benefits of adopting design/thinking, equally as many articles against design thinking, yet little has been discussed about the specific reasons why design thinking may not work. Most often when things are mysterious, intangible and elusive like design thinking, it helps much more to know what design thinking is not in order to understand what it is. Here is my take on the topic. The generic framework of the design process (discover, define, develop, deliver) and its many variations is a great way to try to articulate the process designers adopt in their practice. I don’t believe these stages were ever meant to be applied in a strict, orderly fashion, because for most designers the interaction between each phase is not clear cut and can often intuitively swirl back and forth. Yet, I have witnessed many designers and design teams within organisations cut clear deadlines and metrics against each phase which hinders much organic growth. It is understandable that when presenting design to a client or upper management who are not familiar with the process one becomes tempted to report against fixed phases. This makes you look like you have direction and status metrics by which you can report on a regular basis. But most often than not, this formality robs creativity, adaptation, experimentation and discovery-particularly in novice teams. It not only sets a precedent and expectation that design is predictable, fixed and linear, but it also sets a cultural tone that you cannot step outside of the square. Unless you plan to operate as a lone designer, you are single handedly going to kill design thinking in the team you work with with a bad attitude. I am surprised (and annoyed) by how many self-proclaimed design thinkers narrow-mindedly spit on other ideas in favor of their own. And I am not just talking about ideation sessions where you explicitly state that ideation time is to defer judgement. I am surprised about the behaviour around this sacred, creative ‘safe’ ground. A true designer, or design thinker, is open and encouraging. He or she will build upon ideas or at least be open to the possibility and opportunity of an idea no matter how far-fetched. This encouragement and support is what spurs creative ideation, and as time passes on a project, lowers inhibitions amongst members so that the design team can freely climb higher and more innovative pursuits. I have argued many, MANY, times that fear of failure is the absolute kryptonite to a designerly approach. This fear is also the kryptonite to your success in life, in general. This is why a design approach is liberating for many- it allows, encourages and accepts risk and knows that risk often results in failure. Failure is a good thing, it equals strength and knowledge. Failure helps you make decisions just as much as success does (and is a better teacher at it). Often fear is propagated within a team due to the issues described above and in conjunction with the understandable anxiety around reputation, job security, and the like. If your boss or organisation does not support and understand that the design process is not a one track trick to success- that it also actively encourages failure- then you need to step back and ask yourself if the culture is ripe for the implementation of a design approach. The design process won’t save you. It is not a panacea, and it is naive to assume that it will be the saviour of your troubled business and/or project. This is perhaps why i never understood the continuous debate over the success/failure of a design approach. No model, method or fad to emerge will ever be the answer- it is knowing when and in what context that a method will best achieve the desired outcome. This is why we have experienced design professionals and consultants whom understand if the characteristics and strengths of a design approach will be suitable towards the context and project at hand. Thought needs to be taken when deciding whether to use one approach or another, and design thinking is no exception to this consideration. I’ll admit that as a researcher I took design thinking for granted. I believed so much in the process of design and design thinking that I lost sight of the fact that design is incredibly delicate and sensitive. Sensitive to people’s attitudes, behaviour and application. A designerly approach in itself is not the answer; design needs the right people to manifest the qualities that so many business professionals admire. In either the midst of the meta through academic research, or distracted by the detail in practice, we have lost sight of the real fragility of design thinking. So, I figured now is a good time to reflect on the journey that was the almighty PhD pilgrimage into academic enlightenment. This is less of a practice-based post and so perhaps it will be of more interest, or use, to those considering an academic pathway or who perhaps are curious as to what to do after a PhD. I have chosen to write this based on the most common questions and comments i received during and after my studies and will conclude with hopefully some helpful advice. Common question #238: What is the point of doing a PhD, let alone in design? Depending on your definition of influence and impact, this question is (imho) often expressed out of naivety and ignorance. However, I can see how someone can construct the argument that a PhD is pointless, but it all comes down to value and perspective. If you value the pursuit, tradition and history of scholarly practice, you will understand how humbling it is to contribute to a long history of reflections, insights and theories from many scholars and practitioners committed to evolve and expand knowledge. But if you are of a more practical nature, the analysis, reflection and documentation may seem superfluous, and often at times, outdated to current trends. Writing skills. This is a highly valuable skill in general, but particularly if you are required to write reports, proposals, thought leadership, etc. Strategy. I really believe most PhD’s are highly strategic. You have to scan the field for untapped opportunities then assess many multiple theories, options, and methods for your plan of attack. As I now work in strategy (or strategic design), which involves both strategy and design research, I have realised that much of the formative ‘fuzzy’ front end of design thinking is very similar to the process of PhD research. Public speaking and presenting. I also don’t think anything could prepare you better for client pitches like a review board of professors and/or conference presentations. PhD’s are perhaps best adept at forming and presenting arguments whilst defending anticipated rebuttals. Field research. This is specific to those who conducted primary research and may end up working in a design field or industry applying a design/thinking process that requires field/ethnographic research. As mentioned earlier, the design, methods, analysis and synthesis inherent in design practice are the fundamental building blocks for completing a PhD. Articulation of ideas. Particularly if you are client-facing, being able to clearly and coherently articulate your point/ideas across and in a way that is intellectually accessible to those around you who may not come from your depth of knowledge, is an incredibly persuasive asset. I am sure there are many more I could think of, but these are the PhD skills I use most often on a day to day basis in my work. Common question #592: Why didn’t you stay in academia? There are a few reasons why I didn’t continue down the academic path right now. To be brutally honest, I wanted a rounded career and feared that if I continued with a career in academia I would be labelled an ‘out of touch academic’. This is unfortunately a reality for most academics, even if it (most often) is not true. It is very hard to return to industry after a PhD, (at least in Australia, it seems) let alone after working as an academic for many years. Despite the fact that I already had industry practice, I wanted to obtain more industry experience related to my thesis. I am still open to the idea of returning to academia (hint hint) and will continue to publish from my thesis. Right now the thought of remaining on a very low salary after four years of a near-poverty-wage scholarship is simply suffocating. Common question #475: What are your reflections on academia and practice? I will keep my thoughts brief, as I am currently writing a deeper blog post on this topic. But the TL;DR of it is that, as an academic, you have much more time and freedom to exhaustively reflect on a topic and come to a deeper and more insightful conclusion. Industry has no tolerance for time-consuming, self-indulgent activities like reflective practice. For the most part, this reflection is not needed.. but I feel it is incredibly important if we are going to aim for creativity, let alone innovation, in any kind of practice. Again, this is where a PhD graduate could really add value and particularly if from a design background. So to those still studying for their doctoral thesis- know that you have a choice and that there are options beyond just a post-doc. Present your skills in the right context and language to the industry you are applying and you will find that you have much more to offer beyond the assumption that academics are “just thinkers”. One good thought is worth more than a thousand mindless prototypes. Well looks like we can all just pack up on design thinking and call it a day! There is an author that i had left out of my initial posts on the history and development behind design thinking, and his name is Bruce Archer. Bruce is not as well known as some of the other fundamental theorists in design such as Schon, Rittel and Webber and Simon….and frankly, i dont understand why he isn’t a household name. Mr.Archer’s writings and thinking on design are as innovative and groundbreaking (imho) as the authors we commonly associate with design theory. 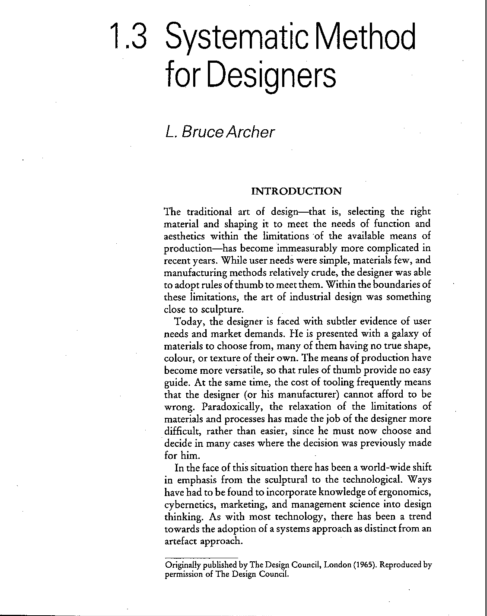 This is because everything that we are still struggling with, writing about today has been discussed and clarified by Bruce, way back in the first generation of design theory. The innovativeness of his thinking at such an early and formative time for design is reason why i believe he deserves more accolade than current researchers have provided. So why did i leave Bruce out of my posts on the history of design thinking? Well, like most of you, i had undervalued his ideas…primarily because he wasn’t as widely cited and referenced as other authors. If researchers don’t get the citation ball rolling by deeming an author appropriate and worthy of recognition, it can create a vicious cycle of ignorance. As i have been cleaning up my thesis for submission i had read over a few references that i scattered around from Bruce. Upon re-evaluation i realised that his ideas were quite innovative, and upon further research, came to the conclusion that Archer is one of design’s hidden gems. I make it sound like he was a nobody, and he certainly wasn’t. Bruce’s name is known within academic design circles, and even has a place in the timeline of design thinking on Wikipedia, (heck, he was part of the establishment of the design methods movement). Yet, i still feel (from reading many theses in design) that his significance is disgracefully under represented. Here, Bruce relates the term “design thinking” to the cognitive and multidisciplinary practice becoming of industrial designers. Let’s just all take a moment to let this sink in. #mindblown. Sounds a lot like Herbert Simon doesn’t it? Simon published the above text in Sciences of the Artificial in 1969 mind you, a good four years after this article. 4. It must have purpose. Intent over exploration. I find this a rather silly argument that many from engineering/computer science fields still like to throw around. Artificial Intelligence isn’t at the stage of achieving complete rational and emotional judgment and i hardly think it will happen for some time (and if it does, it wont replace designers). I like his no BS approach, stating that there is “jargon” in definitions of design, much like we find today in design thinking. What i find humorous about this statement is “a certain amount of common ground is emerging”. I think i have read this about design practice and design thinking in texts over the last 20 years. Yet, in particular to design thinking, there are more publications stating that there is no consensus or common ground on a definition. I think its funny that the fundamental core of our research and practice has been consistently confused since 1965. This situation will probably always remain the same and central to design practice. Here, Bruce acknowledges the fuzziness and ambiguity in design and particularly during the formative phases of design practice. I believe much of the reason behind why many scholars don’t cite Bruce Archer more than they do is that it is freaking hard to get a hand on many of his texts. This article i have referenced from is one of his earlier texts and shows the early stages of his thinking towards design definitions and establishing design as a distinct discipline. His later articles evolve on these lines of thought, centering on why design is a practice distinct from the sciences and humanities. Much like the other theorists of his time, Bruce predicted many things that continue today. However, difference of Bruce is that where other theorists identified one or two aspects common or fundamental to design that may apply to today’s practices, Bruce clearly identified and articulated a very close holistic depiction of design as it currently stands. You have to admit that this is fairly impressive, and it is the reason why i feel we should hold Bruce Archer at the forefront of our mind when we think of fundamental figures in design theory. For me, at least, he is front and centre. **again this is taken from my thesis, please cite where necessary and blabla. Just a quick update to say that more posts are on the way in the coming months. I am in the final stages of wrapping up/editing the PhD and once it has been submitted I will have plenty of new and interesting content that I hope you will all enjoy.